Here at Eco Child’s Play, we LOVE Stubby Pencil Studio when Kate Rosenthal, mama of twin girls started her quest for safe art supplies, she found a wonderful niche to fill. I had the opportunity to meet with Kate a while back and see her in action. We spoke about her quest for safe products, the new CPSC/lead regulations, and how one person’s vision has turned into a busy home business. With Easter coming, we have baskets to fill and my first thought was of Kate and her wonderful shop. So hop on over to Stubby Pencil Studio and order up some of these fabulous eco friendly art supplies and toys (If you are in the Portland area, you can arrange pick up). You’ll feel good knowing that your children are getting safe, sustainable products and our Earth will breathe a bit easier as well. 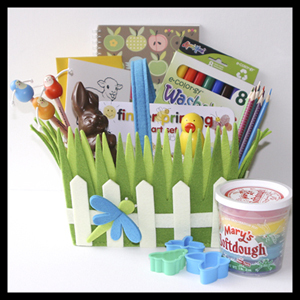 Some of our favorite basket filers: Mary’s Softdough, Beeswax or soy crayons, color ecopencils, Mushroom Kaleidoscopes, Rubber Band Balls (my 8yo son thinks these ROCK), Color N’ Kids cards and the Finger Printing Art Set (this has and always will be one of my FAVORITE art activities). Don’t forget to toss in some organic fair trade chocolate and a few organic fruit lollies, because it just wouldn’t be Easter without a bit of the sweet stuff. While you are striving for an eco concious Easter, consider a twist on the old egg hunt. Don’t throw out those plastic eggs, we simply place ours in the reusable containers and store on the shelf for next year. Our kids like setting out the basket of empty eggs, knowing the Bunny will sneak goodies into them prior to hiding. If you don’t already have plastic eggs on hand (or as they break and become unusable), skip them entirely… The kids LOVE searching for coins laying around at random (Get some math and saving habit lessons going while enjoying the fun). We also like to put out other sustainable and handmade trinkets, like beaded jewelry, felted booties and knit hats. Wrap up the morning with the kids enjoying an art project (like using the Color N’ Kids cards to write love notes to Grandparents, neighbors and friends) which you can deliver (or mail) later. Then enjoy your vegetarian quiche, some yummy buttermilk pancakes and hot maple syrup. « Watch The Lorax Animated Cartoon Here! We also reuse all the plstic eggs, they get tossed in a bag or put in the baskets and stored for next year. We usually hide them all over the house and put money in some of them instead of candy so the kids can put change in their piggy banks.